There are those who walk a middle road, the heroes to whom questions of morality come second to some greater goal. It is to these bold individuals that the gods of balance offer their hands. Whether it's the god of cities and civilization or the guardians of the wild places, the goddess of death or the twisted and insane lord of magic, the neutral gods of Golarion are every bit as active as their righteous or evil counterparts. Often misunderstood, their worshipers run the gambit from enlightened scholars to bloodthirsty paragons of battle, all bound together by the same knowledge: that there are distinctions more important than good versus evil. Information on each of the major neutral gods and his or her corresponding religion, including what's expected of adventurers of various classes, ways for the faithful to identify each other, taboos, devotions and ceremonies, church hierarchies, holy texts, religious holdiays, and more. An overview of the ancient Green Faith, to which many druids still hold. New character traits to help represent and cement a character's background in the church. New feats for holy warriors. New god-specific spells for a wide variety of spellcasters. New magic items designed specifically for members of the faith. New religious organizations and military orders, plus a paladin code for the chosen warriors of Abadar, god of cities. Details on minor neutral deities, powerful fey entities, and more! 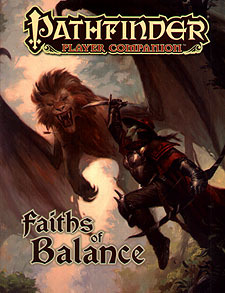 This Pathfinder Player Companion is set in the Pathfinder campaign setting and works best with the Pathfinder Roleplaying Game or the 3.5 version of the world's oldest fantasy roelplaying game, but can easily be incorporated into any fantasy world.